Entering the final weekend, four teams have a chance to win the regular-season championship of the Upper Midwest High School Elite Hockey League. The final weekend of games – which will be played at Fargo, N.D. and Eau Claire, Wis. – will determine the champion of the league’s 10th season. Just three points separate the top four teams in the standings after league-leading Team Northwest lost two out of three games in Week Six. Team Northwest lost 8-0 at Shattuck-St. Mary’s on Wednesday, Oct. 13, then opened the weekend with a 5-3 loss to Team Southeast on Saturday, Oct. 16. Entering the final period tied at 2, Team Northwest took the lead on a goal by Orono’s Ross Luedtke early in the period. But two Team Southeast goals in a span of 1:21, along with an empty-netter, sent Team Northwest to its second straight loss. Team Northwest salvaged the weekend, and preserved a two-point margin in the standings, with a 6-3 victory over Team Northeast on Sunday, Oct. 17. Benilde-St. Margaret’s Patrick Steinhauser and Totino-Grace’s T.J. Roo scored in the first 63 seconds, and Team Northwest went on to build a 4-1 first-period lead. Roo and Benilde-St. Margaret’s Grant Besse each finished with a goal and an assist, while Drew Brevig of Lakeville South, Ryan Jaremko of Elk River and Jonny Brodzinski of Blaine each had a pair of assists. 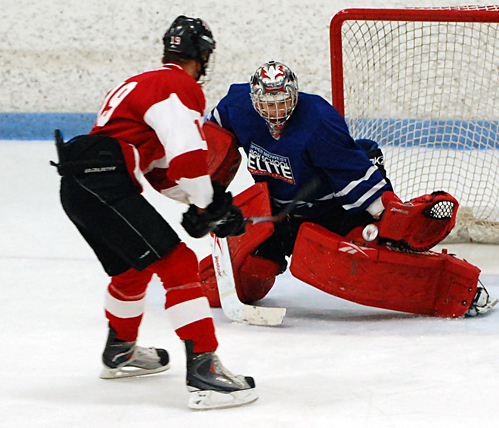 Team Wisconsin moved into a tie for second place with an impressive three-game weekend sweep. Playing in Brainerd, Team Wisconsin opened with a 4-2 win over Great Plains on Saturday morning. Brad Navin of Waupaca scored a pair of goals, while Oregon’s Paul Byrne and Monona Grove’s Trevor Okeson each chipped in two assists. On Saturday night, Navin had another two-point game (1G, 1A) and goalie Saxton Soley of Eau Claire Memorial made 37 saves in a 3-0 shutout of Team North. Sunday morning, Soley was again spectacular, stopping 47 of 48 shots in a 3-1 win over Team Southwest. Navin, Kyle Lee of Wausau West and Cliff Watson of Appleton United each scored for Wisconsin, which will play its final three games this weekend in Eau Claire. For Team North, the loss to Wisconsin was part of a 1-2 weekend that left it tied for second place, two points out of first. The weekend began with a 5-1 win over Team Southwest as Brainerd’s Matt Pohlkamp scored twice in his home arena. Bemidji’s Jordan Heller added a goal and an assist, while Duluth East’s Jake Randolph had two assists. Following the loss to Wisconsin, North ran into a hot goalie in Bryan Nies of Grand Forks Red River and lost 4-2 to Team Great Plains despite holding a 50-27 advantage in shots on goal. Duluth Marshall’s Judd Peterson and Brainerd’s Josh Archibald scored for North. Team Southeast fought its way into title contention with a three-game sweep that left it three points out of first place. In the Elite League’s Tuesday, Oct. 12, showcase game, Taylor Fleming of St. Thomas Academy had two goals and two assists in a 7-4 win over Team Northeast. Tony Barbato of Cretin-Derham Hall added a goal and two assists. On Saturday, Southeast exploded for three third-period goals to come from behind and beat Team Northwest 5-3. Joseph LaBate of Holy Angels had a goal and an assist, and Eagan's Michael Zajac picked up two assists. Team Southeast completed its sweep on Sunday with a 6-5 victory over Shattuck-St. Mary’s. Again Team Southeast came from behind with three goals in the third period, and Apple Valley’s Hudson Fasching scored the game-winner with less than four minutes remaining. St. Thomas Academy's A.J. Reid had two goals and an assist for Southeast. Team Southwest lost two of three to fall to fifth place. Losses to Wisconsin and Team North were sandwiched around a 3-1 win over Great Plains. Minnetonka’s Thomas Schutt scored twice in the win, and goalie Andrew Ford of Eden Prairie stopped 32 of 33 shots. Shattuck-St. Mary’s opened the week with an 8-0 whitewashing of Team Northwest. Teddy Blueger scored twice, and Nicholas Weberg picked up four assists in the victory. Weberg then scored two goals in a 4-2 win over Team Northeast, with Tanner Sorenson adding in two assists. Shattuck-St. Mary’s missed a chance for a three-game sweep, losing 6-5 to Team Southeast despite Sorenson’s four-point game (3G, 1A). Team Great Plains received one of the best goaltending performances of the year when Nies stopped 48 of 50 shots in the 4-2 win over Team North. Brandon Tendeland of West Fargo, N.D., had a goal and an assist in the win. Earlier in the weekend, Great Plains fell 4-2 to Team Wisconsin despite goals from John Simonson of Grand Forks Central, N.D., and Casey Fugleberg of Grand Forks Red River, N.D., and then lost 3-1 to Team Southwest, with Simonson getting the only goal. Team Northeast had an 0-3 weekend, losing 7-4 to Team Southeast, 4-2 to Shattuck and 6-3 to Team Northwest. Eric Freschi of Bloomington Jefferson scored twice in the loss to Team Northwest. NOTES: Southwest Youth Arena in Fargo will host five Elite League games this weekend, including the Team North vs. Team Northwest game at 9 a.m. Sunday that could determine the league champion. Five other games will take place in Eau Claire, where a sweep by Team Wisconsin could result in its first-ever Elite League regular season title. 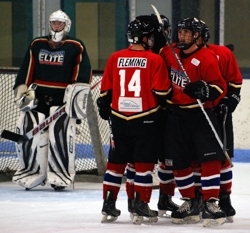 The complete weekend schedule is available at www.hselitehockey.com. … Team Northwest’s Tony Cameranesi of Wayzata continues to lead the league in scoring despite scoring just one goal in his past three games. Cameranesi is tied with Wisconsin’s Brad Navin and Eden Prairie’s Kyle Rau of Team Southwest for the lead in goals with 15. Shattuck-St. Mary’s Kyle Hayton has a 1.89 goals-against average and .936 save percentage, both tops in the league. ... Great Plains goalie Michael Bitzer, a junior from Moorhead, has faced 40 or more shots in six of his last seven games but still maintains a .933 save percentage and 2.71 goals-against average.